Not even chilly midday showers could quiet or dispel the thousands of soccer fans gathered under the shadow of Boston's Fenway Park for the fan festival presented by NBC Sports and the Premier League on Sunday. The NBC Sports’ Premier League studio team broadcasted live from the famed Cask ‘n Flagon sports bar, joined by WWE superstar and Liverpool hype-man Sheamus. NBC Sports Group started its Premier League coverage in the 2013-14 season on a three-year, $250 million deal; two years later, the deal was re-negotiated to a six-year deal worth about $1 billion, almost doubling the asset's value. Though thousands of miles away, the Premier League has grown into one of the most watched soccer league in the United States, and much of its rise can be attributed to NBC Sports' devotion to the property, exemplified through events like this weekend's fan fest next to Fenway. A uniquely Boston-focused story. 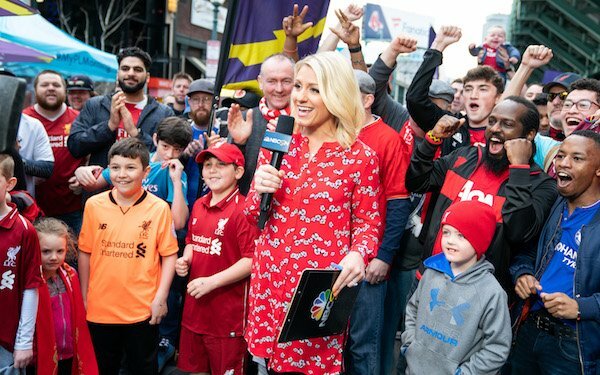 In its third edition this season and the first ever in Boston, the “Premier League Mornings Live” festival culminated in Liverpool vs. Tottenham, a perfect ending for a sports town whose favorite foreign soccer team may well be Liverpool FC. LFC Boston, the city’s official supporter group, has 7,801 followers on Facebook – the next closest foreign team is Arsenal, with 2,671 followers. Though not a perfect metric, supporter Facebook groups offer some perspective on a team’s popularity in American cities. The stoppage-time own goal winner -- and the revival of Liverpool’s title hopes with it -- was not lost on the vastly majority Liverpool fans who filled bars and an entire closed-off Lansdowne street. An American rendition of “He’s Virgil Van Dyke,” drowned out the few Tottenham fans who celebrated with glee 20 minutes before, hoping to be the ultimate rain on an otherwise all-Red parade. It was a party atmosphere throughout the day: Sheamus’ red mohawk and Liverpool crest bicep tattoos hyped up fans as hot dog and pretzel stands kept them full. At Casket ‘n Flagon, kids flocked to a skills challenge, a tattoo saloon, a photo booth -- and two Premier League trophies. At Game On, a bar across the street, families played corn hole, ping pong and massive connect four. According to Palla, it’s all part of the gold rush that NBC Sports sees in the Premier League. Redeeming the American Premier League experience out from dark bars and into the light of day is a crucial part of their strategy. Scratching the surface. After NBC Sports’ first fan fest in Manhattan in 2017, the Premier League came to NBC Sports and offered to be full 50/50 partners on the fan fest initiative. With its club connections, resources and personnel, the Premier League’s involvement adds another layer to the Fan Fest experience. For the games on Saturday and Sunday, NBC reported over 12,000 total fans in attendance. Robbie Mustoe, an ex-Middlesbrough player-turned-analyst for NBC Sports Soccer, lived in Boston for over a decade and has seen soccer grow stateside for years. On Saturday, the New England Revolution played against Minnesota United in Gillette Stadium in Foxboro, 27 miles south of downtown Boston, garnered an announced crowd of 11,571 fans. The comparison is apples to oranges, but it is worthy to mention: in an already-crowded sports market, the Premier League invasion -- aided and fortified by NBC Sports -- continues to keep fans enthralled with foreign soccer rather than domestic. New England Revs’ biggest supporter groups, Midnight Riders and The Rebellion, have 2,920 and 3,342 followers on Facebook, respectively, compared to Liverpool’s nigh-8,000 aforementioned supporter group following. Easy to find. At least that’s how Michael Enko, a Liverpool supporter at the Casket ‘n Flagon bar, saw it. Enko’s a member of LFC Boston, and cited the Fenway Sport Group’s ownership of Liverpool as reason for his allegiance to the Reds. In an American soccer culture that’s often divided between Euro-snobs and MLS fans, Enko added that while he sees MLS making strides, the difference in product is hard to ignore. For now, though, Enko is happy to chant American renditions of Liverpool songs alongside his fellow Bostonian Kopites. 7 comments about "America's Premier League experience moves out from dark bars and into the light of morning". beautiful game, April 1, 2019 at 10:27 p.m.
Any soccer fan worth his salt of passion would watch Liverpool or other top EPL clubs perform on the screen instead of attending a Revs game. Frans Vischer replied, April 2, 2019 at 3:57 p.m. I agree, Valerie. We can watch both. beautiful game, I say if you're a soccer fan truly worth their salt, you'd want the sport to flourish in this country, and aside from the national team, (with our better players playing oversees,) the best we have is MLS. And it'll only get better with our support. MLS used to be an embarassment, admittedly. But it has made great strides, and is becoming really fun to watch. The next 5 years will be amazing. Dan Woog, April 2, 2019 at 5:25 a.m.
Big props to NBC Sports for their full-on support of the Premier League. They've got a great group of announcers and producers, who believe fully in what they're doing -- and NBC trusts them to do the right thing. Valerie Metzler, April 2, 2019 at 9:17 a.m.
To beautiful game, to quote from that great baseball film "A League of Their Own," "can't we do both?" Martin Thalmann replied, April 2, 2019 at 4:41 p.m. Agreed. I follow a couple clubs (Red Bulls, West Ham, Bayern Munich, Celtic) from different leagues. They all are fun to watch even if some of the levels aren't quite as good. Each team has it's own style and the expectations are different which make the viewing experience different. Bob Ashpole, April 2, 2019 at 8 p.m. I loved playing soccer, but I don't love watching someone else play. It isn't the same thing at all. Coaching, helping others play, was a pretty satisfying too, but I can't coach any longer either. I enjoy watching a good match occassionally, but I am not passionate about it. John Soares, April 4, 2019 at 4:49 a.m.